The annual meeting of the Yorktown Civic Association has been scheduled for Wednesday, December 13, starting at 7:30 p.m. at Yorktown High School. The meeting is in the high school cafeteria. The agenda includes election of officers and at-large executive committee members for the next 2 years. Join the YCA on Saturday, October 22 from 10AM to 2PM for a Neighborhood Day event at Chestnut Hills Park on Harrison Street. The event will feature food trucks, musical entertainment (for both children and adults), a bounce house, arts and crafts, and a meet-and greet with great Arlington community organizations! More details, will be posted to the Yorktown Civic Association Facebook page. Contact Amelia (amelia.i.frenkel@gmail.com) if you have any questions or would like to volunteer. The next meeting of the Yorktown Civic Association has been scheduled for Thursday, June 16, starting at 7:30 p.m. in Yorktown High School, Patriot Rm. (enter from door 8 near the athletic field parking lot). The meeting will feature Arlington County Board members Christian Dorsey and John Vihstadt. There will also be an update on crime concerns from Captain Pat Donohue, and updates on the Lee Highway Visioning process and Yorktown's Neighborhood Conservation project efforts. The $1.6 million improvement project was approved by the County Board on April 16, with the cost being split between FY 2016 Pay-As-You-Go Parks maintenance capital funds and funding from Arlington Public Schools. $674,000 of the total was awarded to Fieldturf USA Inc for installation of an EPDM (Ethylene Propylene Diene Monomer) and silica sand replacement field, which is expected to be "softer than crumb rubber and is less abrasive on turf fibers than rubber," according to a press release from Arlington County. The next meeting of the Yorktown Civic Association has been scheduled for Thursday, March 17, starting at 7:30 p.m. in Yorktown High School, Patriot Rm. (enter from door 8 near the athletic field parking lot). After 6 years at the helm of the Yorktown Civic Association, President Andrew Schneider has decided against seeking another 2-year term. Mike Cantwell has assumed the role of interim president and will be asking civic association members to elect him to a new 2-year term. At the meeting, members will also be voting on a new slate of executive committee members, as well as discussing the agenda and objectives for the upcoming year. The next meeting of the Yorktown Civic Association has been scheduled for Thursday, November 19, starting at 7:30 p.m. in Yorktown High School, Patriot Rm. (enter from door 8 near the athletic field parking lot). The meeting will include an update from the Arlington Dept. of Parks and Recreation on additional improvements planned for Chestnut Hills Park, as well as a Q & A session with a representative from the Virginia Dept. of Transportation regarding a major proposal involving adding tolls to I-66 inside the beltway. An informational session to learn more about additional upcoming improvments to Chestnut Hills Park has been scheduled for Thursday, August 13, starting at 6:30 p.m. in the Patriot Hall at Yorktown High School (use the southwest entrance nearest the ball fields). The next meeting of the Yorktown Civic Association has been scheduled for Thursday, April 9, starting at 7:30 p.m. in Yorktown High School. We will have updates from the School System talking about school population growth and the new elementary school. We will also have members of the Arlington County Police Department brief us on efforts to tackle the slate of robberies that took place in the fall as well as an update on some traffic hot spots in our neighborhood. The next meeting of the Yorktown Civic Association has been scheduled for Tuesday, April 22, starting at 7:30 p.m. in Yorktown High School. We will hear from representatives of Arlington Hospital (owner of the new TitleMax/old 7-11 building), as well as updates on the new elementary school and the reconstruction of Chestnut Hills Park. The next meeting of the Yorktown Civic Association has been scheduled for Wednesday, November 20, starting at 7:30 p.m. at Yorktown High School in the Cafeteria. The topics for this meeting will include an update on the new elementary school planned for the Williamsburg campus; the progress on the Lee Highway improvement committee; and the status of the upcoming Chestnut Hills Park renovations. The next meeting of the Yorktown Civic Association has been scheduled for Wednesday, April 24, starting at 7:30 p.m. in Yorktown High School in room A173. Bob Duffy, Director of Planning for Arlington County, will be the guest speaker and is expected to give an overview of major planning efforts currently underway in Arlington, as well as to answer questions about Lee Highway planning efforts. Representatives from the Arlington Parks Department will also be available to provide an update on planned improvements for Chestnut Hills Park. Also, elections will be held for the YCA Executive Committee. The next meeting of the Yorktown Civic Association has been scheduled for Wednesday, February 27, starting at 7:30 p.m. in Yorktown High School in room A265-267. School Board Vice Chair Sally Baird will be the guest speaker to discuss plans for the new elementary school to be built on the Williamsburg Middle School site along with necessary boundary changes. The agenda also includes a representative from the Arlington Parks Department, to discuss planned improvements for Chestnut Hills Park. Preliminary Siting Plans Presented to School Board. The Yorktown Civic Association will meet Thursday, November 8, 2012, at Yorktown High School in Room A275-277. The meeting will cover several topics, including the status of Yorktown High School renovations, planned improvements at Chestnut Hills Park on N. Harrison Street, and the planning process for a new elementary school to be constructed next to Williamsburg Middle School. Steve Stricker from Arlington Public Schools will lead the discussion on the high school renovation process, and Josh Serck from Arlington Parks and Recreation will discuss the Chestnut Hills project. Arlington Public Schools has awarded a contract to VMDO Architects, P.C., of Charlottesville, to design a new elementary school on the Williamsburg Middle School site. The project will have a capacity for 600 students and is expected to cost $35 to 40 million, with a planned start date of January 2014 and move-in target of summer 2015. The project design is currently going through a Building Level Planning Committee (BLPC) process directed by Arlington Public Schools, as well as a Public Facilities Review Committee (PFRC) process under the direction of the Arlington County Board, which is designed to insure the project adheres to Arlington County government requirements and goals. While the Williamsburg site is within the boundary of the Rock Spring Civic Association, the neighboring Yorktown and Williamsburg civic associations have been asked to participate in both review committees. The APS web page for the project can be found at: http://www.apsva.us/Page/18930. Meanwhile, the School Board has also started a corresponding process to adjust boundary and program changes for five elementary schools — Jamestown, Nottingham, Tuckahoe, Glebe and Taylor — that surround the new school at Williamsburg site. The Yorktown Civic Association will meet Tuesday, May 24, 2011 at 7:30 pm, at Yorktown High School in Room 222. The major agenda item will be a presentation and update from Arlington Public Schools on the ongoing renovation of Yorktown High Schoool. While the civic association web site won't be going away, please join the new Yorktown Civic Association Group on Facebook for more timely updates on upcoming meetings and for discussions on current issues and topics. The Yorktown Civic Association is in the process of securing funding for a pedestrian and traffic safety improvement project through Arlington's Neighborhood Conservation program that would involve new crosswalks and other safety improvements on Yorktown Boulevard between the Little Falls and George Mason Drive intersections (including in front of Yorktown High School). A planning meeting was held with residents living in that immediate area along with county staff on Tuesday, February 8, 2011, to finalize project options. Yorktown neighborhood residents are invited to join in a 2.3 mile Yorktown Walkabout with Arlington county officials and members of the WalkArlington committee beginning at 3:00 p.m. on Sunday, September 26, at Greenbrier Park. Arlington County Board Chairman Jay Fisette is expected to participate in the event. The annual organization meeting of the Yorktown Civic Association will be held on Monday, February 22, 2009, at Yorktown High School beginning at 7:30 p.m. in room 1B. At the meeting, which is open to all neighborhood residents, there will be a presentation by Arlington Public Schools facilities staff on the status of the Yorktown High School rebuilding project. An update will also be provided by Marymount University leadership on the ongoing Marymount University expansion project, as well as the University's current master planning process. And possible safety improvements on Yorktown Boulevard will also be discussed. The biennial civic association elections will also be held. The long-awaited Yorktown High School renewal and Marymount University expansion projects are finally underway, and both are expected to generate significant construction traffic and noise in the neighborhood. The winter meeting of the Yorktown Civic Association was held on Wednesday, February 11, 2009, at Yorktown High School. At the meeting, which was open to all neighborhood residents, we heard from Arlington School Board Vice Chair Sally Baird and from Tom Rice, Arlington's Director of Real Estate Assessments. Updates were also provided on several projects affecting the neighborhood. As part of Arlington's 2009 Neighborhood Day festivies, the Yorktown Civic Association is sponsoring a Neighborhood Fun Time for Kids at Chestnut Hills Park from 10 am to noon on Saturday, May 16, 2009. There will be a moon bounce, free balloons and snacks, face painting, a fire truck and loads of fun! Bring your kids and join in the fun at the neighborhood park in the 2700 block of N. Harrison Street. Bids on the upcoming Yorktown High School renovation project came in substantially below budget thanks to weakness in the current economy, and the School Board awarded the construction contract to Hess Construction on Thursday, January 22. Preparations for construction are continuing, and a neighborhood pre-construction meeting was held on Thursday, January 29. Construction is finally beginning on a major expansion project at Marymount University, where a new dormitory, classroom and parking structure will be constructed at the current surfact parking lot site at 26th Street and Old Dominion. The initial phase of construction involves undergrounding of utilities along the south perimeter of the site (26th Street). Pile driving associated with the planned underground parking structure is expected to begin in early February, pending issuance of final building permits. A pre-construction meeting for surrounding neighborhoods was held on Monday, October 20, and the groundbreaking ceremony and reception to kick off the project was held on Sunday, October 19, 2008. The Arlington County Board has finalized agreements with the Virginia Department of Transportation (VDOT) and awarded contracts for long-awaited improvements at the intersection of Lee Highway and N. Harrison Street. Construction of those improvements are now expected to begin in early 2009. The improvements will include dedicated left turn lanes off of Lee onto N. Harrison Street, improved crosswalks, and new stop-lights with pedestrian countdown signals. The quarterly meeting of the Yorktown Civic Association was held on Thursday, October 23, 2008, at 7:30 p.m. at Yorktown High School in the cafeteria. At the meeting, neighborhood residents heard from Arlington County Manager Ron Carlee and received updates on several major neighborhood projects. Arlington Public Schools Director of Design and Construction Services, William O’Connor, also discussed the upcoming Yorktown High School renovation project. Funding for the project is the major element of the $99 million 2008 School Bond that Arlington voters are being asked to approve in November. Construction bids are scheduled to be approved for the project shortly after the election, and construction is scheduled to start on the Yorktown Boulevard side of the building in January. The project is expected to last nearly five years. Arlington's neighborhoods are likely to learn on July 19 whether the county will be establishing formal guidelines for allowing the inclusion of basement and attic apartments in homes in areas of the county currently zoned for single-family residences. Currently, the county does not legally allow such apartment units in single family homes, although they are known to exist throughout the county. Athough the "accessory dwelling" proposal has gone through several iterations since first being taken up by the county's Housing Commission, the approach advertised for consideration by the County Board would restrict such units to: 1) no more than 750 square feet, 2) no more than two occupants, and 3) owner-occupied homes that currently conform to lot size limits. Neighborhood residents interested in this issue are encouraged to submit their comments to the County Board prior to the July 19 hearing at: CountyBoard@ArlingtonVA.us. On March 26, Superintendent Robert Smith abandoned plans to use part of Chestnut Hills Park on North Harrison Street for construction worker parking for the upcoming renovation of Yorktown High School. On March 13, Arlington public school (APS) officials had confirmed that they intended to proceed with plans to place all of the construction worker parking for the high school renovation project in a portion of Arlington's most popular children's park, our very own Chestnut Hills Park on North Harrison Street. This move would have set the precedent of allowing the school system to freely select open park land any where it wants to meet its excess parking needs. The area that would have been taken by the school system is a favorite place for kite flying, sledding and playing catch, and its loss would be felt by users. The plan would have involved building an extemely unattractive, industrial-looking graveled parking area across the entire 1 acre of open park lawn. Park users and neighbors felt that it would have destroyed the beauty and safety of the entire park. The plan was to have the parking in place at the start of the school construction project on June 15, 2008. The civic association had expressed strong opposition to this proposal and appreciates the help of members and park users in stopping it! The Yorktown Civic Association held its annual meeting on Wednesday, January 30, at Yorktown High School. In addition to adoption of the annual budget and election of civic association officer and executive committee positions, the major topic was the upcoming renovation of Yorktown High School, which is now scheduled to begin after the end of the current school year. At the meeting, an update was also provided on the upcoming expansion project at Marymount University, plus Arlington Couny urban forester spoke speak about tree preservation and maintenance issues in the neighborhood. The Yorktown Civic Association will held its quarterly meeting on Thursday, October 4, 2007. County Board Member Barbara Favola was the guest speaker. The major topic was the upcoming renovation of Yorktown High School, which was scheduled to go before the County Board on October 13 for use permit approval. At the meeting, updates were also provided on the upcoming expansion project at Marymount University, and a vote was held on support for a 4-way stop at the N. 27th Street/N. Florida Street intersection (approved). Marymount University has received approval for a use permit from Arlington County for the construction of underground parking, along with two new buildings on the block currently used for surface-level parking at the corner of 26th Street North and Old Dominion Drive. Construction is expected to begin by mid-2008. Modifications to the project were presented at a task force meeting on May 1, 2007, that would eliminate a large auditorium from the project, thereby providing room for greater building setbacks and the reduction of one floor from the proposed dormitory height. The Yorktown Civic Association voted to oppose the original design for the project in October 2006 but supported the final design. At a November 20, 2006, Planning Commission review of the project, commissioners voted to defer taking a position on the project. On December 12, 2006, the County Board held a hearing on the project, and after taking testimony from 34 speakers, a decision on the project was deferred until the County Board's March 17, 2007, meeting, at which time a decision was again deferred. In the meantime, the County has hired Tracey Pilkerton to serve as a facilitator to sort out issues on the project. Meetings as part of the formal facilitation process begin in March. Marymount, itself, does not fall within a civic association boundary. The adjoining civic associations are: Yorktown, Old Dominion, Donaldson Run, and Rock Spring. Arlington County Board Chairman Paul Ferguson was the guest speaker at the quarterly meeting of the Yorktown Civic Association on Monday, May 7. He addressed the the upcoming renovation of Yorktown High School, as well as the Marymount University expansion project, and took questions from neighborhood residents. Marymount's V.P. for Student Services, Chris Domes, will also discussed the latest changes to the Marymount project. Sarah Woodhead, APS Director of Facilities and Design, also attended the meeting to share the latest on the Yorktown High renovation project. The owner of the WAVA radio tower near the corner of Lee Highway and George Mason has been seeking approval from the Arlington County Board to replace its existing tower with a new, free-standing tower (without the existing guide wires) at the same location. The tower replacement appeared necessary due to development plans on the adjacent AT&T property site. The new owner/developer of that property brought suit against the WAVA owner for removal of the tower's support wire connections from their property. Even though the tower sits within the boundaries of the Leeway-Overlee Civic Association, the Yorktown Civic Association and two other adjacent neighborhoods have participated in several meetings about the tower replacement. The surrounding neighborhoods had insisted that efforts be made to reduce interference from the radio stations as part of any approval to allow construction of replacement towers. Nearby homeowners have reported interference on their radios and TVs, as well as a broad range of other electronic devices. And on April 10, the tower owner bowed to these concerns and opted to end plans to replace the tower. This is one of three towers south of Lee Highway. It is the thin tower	that is the closest to the intersection (just behind the Bank of America building). It broadcasts WAVA AM and FM signals, as well as WBIG FM. Despite recent safety improvements on North Harrison Street between Lee Highway and Little Falls Road, speeding is still a problem in front of Chestnut Hills Park, especially in the southbound direction, according to a comparative analysis released by the Arlington County Dept. of Environmental Services in February 2007. The report was prepared as a followup to the installation of bike lanes, parking lanes, a speed indicator signal, new crosswalks, and other sign and marking changes. The safety improvements were requested by the civic association and residents on Harrison Street in response to accidents and safety concerns near Chestnut Hills Park. While speeding has declined somewhat in the northbound direction, that improvement has been offset by an increase in traffic volume and speeding in the southbound direction. As a result the county is recommending installation of an additional speed indicator. The winter meeting of the Yorktown Civic Association was held on Tuesday, January 16, 2007, at Yorktown High School. At the meeting, the civic association approved on a vote of 29 to 0 a resolution opposing Superintendent Robert Smith's recommendation to include just 268 parking spaces as part of the new design for Yorktown High when it is presented to the School Board on January 18. The School Board is also scheduled to hold a public meeting on the Yorktown High project at the school on Tuesday, January 23 (NOTE: the start time for that meeting has been changed to 8:30 p.m.), followed by a vote on the project at its February 1 meeting. Neighborhood residents were asked to attend the January 23 meeting and voice their opposition to the proposed design (flyer on Board meeting [pdf]). The meeting agenda also included a discussion of neighborhood priorities during a facilitation process initiated by the County Board for the Marymount expansion project prior to the Board's action on the that project at its March 17, 2007, meeting. At the civic association meeting, the annual budget was also approved. 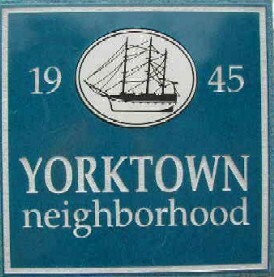 A neighborhood meeting was held on Thursday, December 7, 2006 at Yorktown High School on the amount of off-street parking planned for Yorktown High School after its renovation. Arlington voters overwhelminly approved the fall bond election, which contained the first installment of funding for a $100 million renovation of the school, and in mid-January APS design and facilities plans to present the planned design for the project to the Arlington School Board. Unfortunately for neighborhood residents, APS staff is not living up to the terms of a master plan developed for the overall Greenbrier Park/YHS projects in 2002 which called for a total of 346 off-street parking spaces. At the meeting, residents agreed that that the combined Yorktown High/Greenbrier Park complex should have at least 400 off-street parking spaces, and that structured parking should be considered in the design for the new Yorktown High Building when the School Board takes up the project at its January meeting. School Board Vice Chair Libby Garvey was the guest speaker at the quarterly meeting of the Yorktown Civic Association on Wednesday, October 18, 2006, at Yorktown High School. Ms. Garvey discussed plans for renovating Yorktown High School and other school projects scheduled for the fall school bond election. A topic of discussion was the YHS renovation plans in the area of parking, as the current plans for the school fall well short of the amount approved in the master plan for the overall Greenbrier Park/YHS renovation. The other major agenda was Marymount University's plans for new classrooms, dorms and underground parking at the current surface parking lot site at the intersection of Old Dominion and 26th Street. The membership voted to adopt a resolution opposing the Marymount project in its current form. On July 11, the County Board voted to provide initial funding, as recommended a few days earlier by the Arlington School Board, for complete renovation of Yorktown High School. The plan calls for $24.8 million to be included for the project in the 2006 bond election, with an additional $75 million included as part of the 2008 bond election. The approved plans calls for construction to begin around July 2008. The funding plan is based on a preliminary design selected on May 8 by the School Board-appointed Building Level Planning Committee (BLPC) for rebuilding Yorktown High School from five alternatives prepared by the project architect, Ehrenkranz Eckstut and Kuhn (EEK). That plan was presented to the Arlington School Board at its June 15, 2006, meeting, and on July 6 the School Board made its final decision to include funding for the project in the fall 2006 bond election. The BLPC action followed a public work session on the Yorktown High School renovation project which was held on Monday, April 17, 2006, at the school. The work session was required by both School Board and County procedures and members of the School Board attended, as did members of the Arlington County Planning and Transportation Commissions. Members of the Building Level Planning Committee (BLPC), a formally-appointed group of stakeholders in the project, have been meeting for several months on the project. The neighborhood is represented on the BLPC by Cate Mueller, Seth Verry, and Asmita Bhat. Planning Commissioner and Yorktown resident Ted Weihe also serves on the BLPC. "After renewing the use permit for live entertainment for two (2) months in November 2005 to allow the applicant time to remedy condition violations, the County Board heard the item in January 2006 and, based on the progress made by the applicant tempered by the concerns of the neighborhood, renewed the use permit for six (6) months. During the review process in January, staff committed to both the County Board and the neighborhood to continue to work with the applicant to ensure compliance with the conditions. An administrative review in April 2006 indicated that the applicant continued to operate in compliance with the conditions. However, following this administrative review, the applicant allowed an outside promoter to organize dance parties commencing on April 20, 2006 with live entertainment during times not permitted under the conditions of the use permit. Staff concludes that the activity was an egregious violation of the use permit conditions, and recommends that the County Board not renew the use permit." County staff have determined that the block of North Harrison Street between the Little Falls Road and Yorktown Boulevard is eligible for the expedited "Missing Link" sidewalk installation program. This block is currently the only segment of North Harrison from Patrick Henry Drive to the McLean border that does not have a sidewalk on both sides of the street. Installation of a sidewalk on this block was recommended by the neighborhood in its recently approved Neighborhood Conservation Plan update. However, the Missing Link application required review by both the Yorktown and Rock Springs neighborhoods since the segment straddles the boundary between the two neighborhoods. At its July 11, 2006, the County Board adopted project funding recommendeds for the spring funding round of the Neighborhood Traffic Calming program. Of the four projects included, one is nearby N. Lexington Street. Three textured crosswalks on the north, east, and west side of North Lexington Street. North Lexington Street from Lee Highway to Little Falls Road falls within the Williamsburg and Leeway Overlee Civic Associations neighborhoods and is designated as a neighborhood-minor street and carries approximately 1,504 vehicles per day. The quarterly Yorktown Civic Association meeting was held on Wednesday, June 14, 2006, at Yorktown High School. The agenda included discussions of the upcoming renovation of Yorktown High School, the expansion of Marymount University, and conditions at the Garden City shopping area. County, school system, and Marymount staff answered questions on these topics at the meeting. The membership voted to oppose renewal of the Palladium's live entertainment use permit at Garden City, and considered - but rejected - a motion to support deferral of funding for the Yorktown High renovation until the 2008 county school bond. Arlington's Transportation Engineering staff has released plans for traffic safety improvements at the intersection of Yorktown Blvd. and N. Harrison Street. While the intersection falls within the boundaries of the Rock Spring Civic Association, Yorktown neighorhood residents have long expressed interest in safety improvements at the intersection. The plans call for stop lights on pedestals with modern count-down crosswalk signals. Nubs will also be installed at each of the crosswalks to improve pedestrian safety. Please direct comments on the plans to county traffic engineer Valerie Lee at 703/228-3722 or by email at Vlee@arlingtonva.us. The long-planned improvements for the accident-prone Lee Highway intersection with George Mason Drive are finally underway. When completed later this spring, the project will add dedicated left-turn lanes from Lee Highway onto George Mason from both directions, as well as new traffic signals. The project also involves signficant improvements and widening to the sidewalks near the intersection, as well a slight reallignment of the intersection of George Mason with the adjoining side streets. The Yorktown Civic Association quarterly meeting was held on Monday, March 27, at Yorktown High School. Current Arlington County Board Chairman Chris Zimmerman was the guest speaker. The agenda also included a discussion of Marymount University's building plans for the current surface parking lot location at the 26th Street North and Old Dominion Drive, as well as renovation plans for Yorktown High School. Construction has begun on traffic calming improvements approved in 2004 on Little Falls Road from the Harrison Street to Yorktown Boulevard intersections. The most significant aspect of the project is the installation of "nubs" at the Little Falls/Harrison intersection to improve pedestrian safety and traffic safety at the intersection's existing 4-way stop Read more..
County Board Members Attend "Greenbrier Project Preview @ The Tent Event!" On Saturday, March 11, 2006, at 11:30 a.m., the Arlington Department of Parks, Recreation and Cultural Affairs held a special event at Greenbrier Park to highlight the improvements currently being made. Construction at the park started earlier this year, but an earlier groundbreaking ceremony was canceled due to poor weather conditions. The Yorktown Civic Association annual meeting was held on Wednesday, December 7, 2005, at Yorktown High School in room 1B beginning at 7:30 p.m. In addition to election of officers and approval of the annual budget, the meeting will focus on several current issues for the neighborhood. Arlington County's Parking Manager, Sarah Stott, will discuss the residential permit parking program and answer questions about parking problems that can be expected during the upcoming construction at Greenbrier Park. Steve Larson, the school system's point person on parking issues will also be at the meeting. The agenda will also include a discussion about the plans for renovating Yorktown High School and for upcoming meetings regarding zoning enforcement and the need for improvements at the Garden City Shopping Center. At its meeting on November 16, 2005, the County Board voted 5-0 to award the $10.4 million contract for renovating Greenbrier Park to Corinthian Contractors, Inc., of Arlington. The project will include installation of a new synthetic turf football field and new concrete bleachers. A new track will be built around the football field, and the existing lower park tier will be replaced with 2 new tiers containing two dedicated softball diamonds and a new baseball diamond with its own seating. The project also involves the replacement of the press box, concession stand, and rest rooms. More information on the renovation of Greenbrier Park can be found by clicking this link. Download County Board report on contract approval (.pdf file). Download final Greenbrier Park operational plans (Word .doc file). The Yorktown Civic Association held its quarterly meeting on Monday, September 26, 2005, at Yorktown High School. The final plans for the renovation of Greenbrier Park were presented (more). And Mary Hynes, Arlington School Board Vice Chairmain, addressed the planned phase II renovations of Yorktown High School, and related issues. The Yorktown Civic Association Spring Meeting was held on Wednesday, May 18, 2005, at Yorktown High School, with County Board Chairman Jay Fisette as the guest speaker. Chairman Fisette shared his thoughts on the upcoming renovations of Greenbrier Park, recent Board action involving the Garden City Shopping Center, residential in-fill zoning changes under consideration by the county and other current issues. Members will also received a presentation on the Neighborhood Watch program from the Arlington Police Department. Arlington held Neighborhood Day 2005 on Saturday, May 14, and the Yorktown Civic Association joined in the fun by hosting its annual Neighborhood Day at Chestnut Hills Park event. The event featured a clown, a fire truck, snacks for the kids and lots of balloons. For a complete list of all Neighborhood Day events in Arlington see: http://www.arlingtonva.us/nd2005/NeighborhoodDayEvents.aspx. The Yorktown Civic Association Winter Meeting was held on Tuesday, February 15, 2004, at Yorktown High School. The major agenda was the discussion and adoption of the Yorktown Neighborhood Plan that has been prepared as part of the Arlington Neighborhood Conservation Program. The Civic Association has been working on the plan update for more than a year. The effort was started in late 2003 with a survey of every household in the neighorhood. The plan goes on to county staff for review and goes to the County Planning Commission and the County Board for approval. On Thursday, February 17, the fourth and final public forum on the design specifics for Greenbrier Park's planned renovations was held at Yorktown High School. The focus of the meeting was operational issues, such as hours of operation, public access to the track, etc. The first of the "park design workshops" on the upcoming redevelopment of Greenbrier Park was hosted by the Arlington Parks Department on Tuesday, Sept. 21, 2004, at Yorktown High School. On June 26, 2004, the Arlington County Board approved a contract authorizing the expenditure of up to $775,000 for the detailed design of Greenbrier Park improvements. The Board also voted to include $8.6-million in the fall 2004 bond election for Greenbrier Park improvements. These actions signal that construction of park improvements is likely to begin in 2005. In addition to the meeting on Sept. 21, two additional public meetings are expected to be scheduled later this year regarding the park design. Read more.. Neighborhood Work Groups Developed Plans for 27th Street N. and Little Falls Rd. After several months of work that included a formal petition process of neighborhood residents, the Arlington Neighborhood Traffic Calming Committee (NTCC) voted to include two neighborhood projects in a package of 7 projects that would be forwarded to the County Board for funding as part of the NTCC's fall funding round. The first of the 2 projects is Little Falls Road between Harrison Street and Yorktown Boulevard and it will include a speed cushion and nubs at the Harrison intersection. Smaller nubs will also be installed at Greencastle Street and Yorktown Boulevard. The second project is on 27th Street N. between Harrison and Lexington Streets. This segment was considered as part of the Traffic Calming Program's expedited speed bump effort, and 3 speed humps will be installed. Read more..
Several volunteers are needed from the neighborhood to participate in training as part of the Arlington Community Emergency Response Team (CERT) program. Several slots have been reserved for the Yorktown neighborhood in training classes that begin in early October. If you are interested in this training please contact YCA President David Haring at dharing@yorktowncivic.org or at 703/241-8111 (h). At its July 10, 2004, meeting, the Arlington County Board approved projects included in the Neighborhood Traffic Calming Committee's spring funding round. On June 17, the Committee voted to send to the County Board plans developed by neighborhood residents for traffic calming measures on 25th and 26th Streets. The committee's approval came after roughly 80% of the 255 households in the project area signed petitions of formal support for the project. Development of the projects was kicked off on Wednesday, Feb. 4, 2004, when members of the Arlington County Neighborhood Traffic Calming Program approved N. 25th and 26th Streets between George Mason Drive and Glebe Road for consideration of traffic calming measures. Traffic calming assistance was requested by several residents on each street. An organizational meeting for this effort was held on Feb. 25, followed by additional meetings to discuss project options. Program rules require, however, that at least 60% of the 200 households in the affected area sign petitions in support of the project. An open house on April 14, 2004, gave affected residents an opportunity to review the plans and ask questions about the project. Read more..
On June 18, 2004, the Yorktown Civic Association submitted an application for funding for improvements at the Garden City Shopping Center, at the intersection of Lee Highway and George Mason Drive, under Arlington County's new Commercial Revitalization program. The program was established with bond funding approved by Arlington voters in the 2002 bond election. It is currently anticipated that the County Manager will select a number of candidate projects from the initial applications sometime in late 2004. The civic association also signed onto a separate application submitteed jointy by several civic associations along Lee Highway for a longer-term effort to study development along Lee Highway. Read more..
Arlington County transportation officials met with neighborhood residents on Monday, June 28, to present plans for possible traffic improvements along Harrison Street from Lee Highway through the Little Falls intersection. The plans are the result of a planning meeting held with residents on April 20, 2004, to collect neighborhood input on traffic speed and pedestrian safety concerns	in the segment of North Harrison Street from Lee Highway through the Little Falls Road intersection. The meeting involved tabletop planning excercises that helped facilitate discussion of possible solutions, and gave residents an opportunity to talk about the sign and striping changes made late last year, as well as plans for the Lee Highway interesection and recent discussions about the possibility of nubs at the Little Falls interesection. This segment of Harrison has also been included in a major county initiative to develop traffic calming options for arterial streets. Read more.. The Arlington Public School Board is in the process of performing a multi-phase upgrade to the Yorktown High School facility. Phase I, which involves construction of a 30-classroom addition, is slated for completion in time for the start of the 2004-05 school year. Phase II would involve the renovation of the existing structure, and planning for that phase is slated to begin in 2005. The FY05-10 Capital Improvement Program includes $2.23-million in planning and design funding for phase II. Arlington voters will be asked in the November, 2004, general election to approve the bond that would pay for that CIP. The phase II renovation is currently projected to cost $54-million and would occur beginning in FY2007. Read more.. The Arlington County Public Works Department held a public meeting with residents of the Yorktown, Langston and Old Dominion neighborhoods to discuss short and long term options for improving traffic flow and safety along Lee Highway between Buchanan and Edison Streets. The meeting was held at Langston School on Tuesday, March 9. One of the first steps to be taken will be the installation of a traffic light at the corner of Lee Highway and Edison Street. For further details on the options being considered by the County, contact Bridget Obikoya of the Transportation Engineering and Operations Division at (703)228-7511 or by email at bobikoya@arlingtonva.us. The County's analysis can be found at: Corridor Analysis of Lee Highway from North Buchanan to North Edison Streets. The Public Works Dept. and Public School System have agreed upon a plan to construct a median and nubs on Yorktown Boulevard at the exit from Yorktown High's bus drop-off area on the school's north side. These changes to Yorktown Boulevard would be funded under Arlington County's "Safe Routes to Schools" program, with construction taking place during the summer of 2004. Drawing (pdf file)..
Arlington County Board Chairman Paul Ferguson toured the Yorktown neighborhood and met with residents on Saturday, Sept. 27, recovering from a week-long power outage in the aftermath of Hurricane Isabel. Joining Ferguson were fellow Board members Barbara Favola and Walter Tejada, along with County Manager Ron Carlee and a representative of Virginia Dominion Power company. Read more..
At its meeting on July 19, 2003, the Arlington County Board approved a round of traffic calming projects, which included one project in the Yorktown neighborhood. The project involves the installation of speed humps and other improvements on North Florida Street from George Mason/Lee Highway to 26th Street. Read more..